Embroidery Prices for 5000 stitches or less Garments Not Included! not available to order embroidery on line at this time. Embroidery Prices for 5000 stitches or less . Garments Not Included! You can use Multi-colors threads with embroidery at no extra cost! Each 1000 stitches past 5000 Stitches, extra $1.00 per thousand stitches for Embroidery per unit. 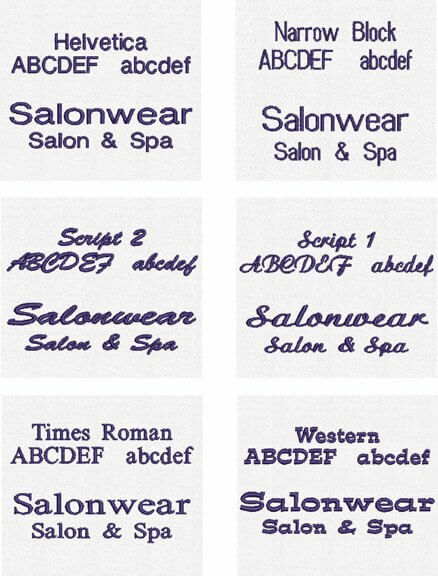 Other Fonts Available upon Request.If for any reason, you are unhappy with your Salonwear garment, please return the garment in its original condition within 7 days of the date received for cash back or within 30 days for a merchandise credit. Our products are unconditionally guaranteed for normal wear against any defects in workmanship or material for 6 months from purchase date. Simply return the product to Salonwear with your sales receipt at the address below for repair or replacement. No exchange or refunds on worn or washed garments. No exchange or refunds will be accepted after 30 days. All printed and custom-made merchandise orders are non-returnable, non-refundable, not cancelable and final and require prepayment. Prices subject to change without notice! Allow 1 to 6 weeks delivery. Colors subject to change with out notice. Shipping charges are added to the purchase and are not refundable. No refunds allowed for stage or screen use. Salonwear reserves the right to use all images for promotional purposes unless specifically requested in writing. For exchanges or returns, repack the unused and unwashed item(s), include the packing slip, enclose a letter describing the reason for its exchange or return and ship prepaid to: Salonwear E change/Return, 2525 Nevada Ave. N. #305 Minneapolis, Minnesota, 55427 Due to circumstances beyond our control, we cannot always guarantee the exact shade of material. Minor differences may also occur in fabric weight, fabric finish, size and construction of the finished product. We assume no liability for delays in or failure to make delivery due to our inability to obtain supplies or finish production. Exchanges will not incur a restocking fee. Refunds will incur a 10% restocking fee when returned within 30 days. Salonwear • 2525 Nevada Ave. N. #305 • Golden Valley, MN 55427 www.salonwear.com • 800-635-3323 • 763-545-5550 • 763-545-4318 Salonwear's provides following services in embroidered clothing. I ordered apron with my salon logo embroidered on it. Fantastic product,awesome! Excellent product. Really good quality materials have been used. All this with that great price point, what more could you want. Thank you! I ordered 12 aprons, each having the logo of our salon. Very impressive product. I like embroidery on clothes so I decided to try it with my salon wear, I ordered 5 aprons, 4 robes and 2 headbands all having my salon logo.